Season of offer is not yet ended, and still there are lots of giveaways which are always available for users freely. 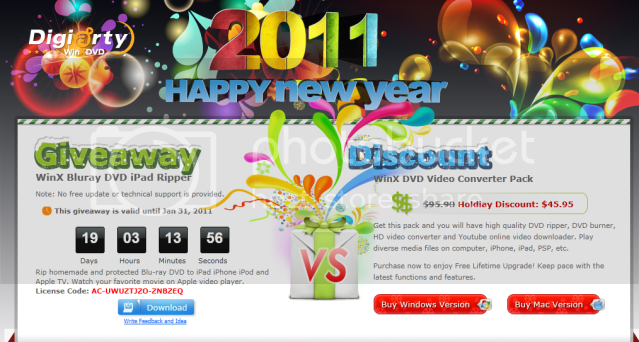 Again its great to hear giveaway offer from Digiarty where they just released WinX Bluray DVD iPad Ripper 4.50 with remarkably improved functions. In order to give their users some benefit from our new features at first time they are providing this software (Original $29.95) to all users at free of cost. It is an all-round Blu-ray Disc and DVD to iPad converting solution which is specialized in ripping Blu-ray and DVDs to iPad, iPod, iPhone, Apple TV. The latest version is strengthened with advanced Blu-ray ripping engine, featuring No.1 fast speed to rip and convert both homemade and AACS protected Blu-ray. Moreover, it adopts the unique Blu-ray reader cache technology that helps prolong the lifespan of Blu-ray devices. So what are you waiting for, here is the license code for it.